If we don't live a life of Principle, always we will have pay indemnity. We have to be grateful to TPs, because once we live in CIG, once we make the heavenly kingdom, then we won't need to pay indemnity. Why? We can see so many different lifestyles, when we look at family members, and we can see that we have been living a lifestyle with fallen nature. But, now TF opened the gate of heaven, so we are now going to be living in the Heavenly Kingdom. In order to have the FD, we are going to have the holy wine ceremony. Through the holy wine ceremony God will forgive everything. In the Heavenly Kingdom, what type of people is going to be living in the Holy Kingdom? Little by little, day by day, people can become perfect, and live with AFLO. Today better than yesterday, and tomorrow better than today. Those are the people to whom God is going to give His heavenly blessing. If, living in the heavenly kingdom, we don't live a Principled lifestyle, then indemnity is coming. We have to "see" ourselves today. Do "I" live faithfully; do I make a foundation of faith and substance? We have to think about this. Are TPs in my heart? We have to check ourselves. Is the way I am living my life a Principled lifestyle, or not. Whatever happens, whenever a difficult time is coming, never blame other people, never complain, but always be grateful. Because TPs are protecting "me," the problems don't become so big. So, "I" am grateful. We should all have this kind of attitude. If we live like this, with this kind of lifestyle, then our family can become filled with peace and happiness. Cultural differences between Korea and Japan, or international, are not always so easy. We have to respect other cultures. For example, there is a Korean/Japanese 6,000 blessed couple. The Japanese wife came to Korea, then the Korean mother-in-law always comes to mealtime. But the Japanese wife couldn't understand Korean culture. She felt the mother-in-law should eat at her own home, and that way there could be more peace. But that is not right. Because the Japanese wife must be happy to have the mother in-law to eat a meal together. That is attendance. If you go to a bakery, the mother and daughter always buy for themselves and don't think about the other person. Parents’ in-law and daughter, very individualistic. Relationship between parents and children is unity, is one. Always obedience. That obedience is most important. Obey parents, and love brothers and sisters, that is very important. Always, if you don't do for me, then I don't do for you. That way of thinking is also not good. We have to live for the sake of each other. We have to live with true love. If we all life FSO, then that culture becomes a heavenly culture. Who is a heavenly citizen? A person who is going to live a Principled way of life. If we have an evil mind, we cannot live. Because of TPs love, TF established FD. This is love. Always, we have to check ourselves. If we have a lazy life, then when we go to SW, it is going to be trouble. If we don't think, but only act without thinking, then if we live in the heavenly kingdom, our heart is going to ache. So we have to do well. In order to have a FD, we have to write a confession, which will soon be burned. 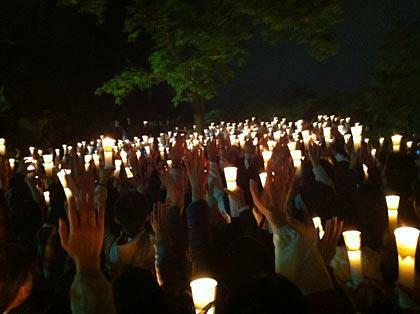 Maybe for Korea and Japan, during the Azalea Festival they will be burned. Other countries may have a different time for burning. This confession letter has secrets known only to me, and yet we cannot so easily erase these secrets from our memory. But, if we attend the burning ceremony then these things will be completely erased from our burning. But, if we could not attend, then the secret will remain in our memory. So, DMN is thinking how to help countries all over the world, for people who for some reason cannot attend the ceremony, how to erase those memories. It is very difficult to erase the body's memory, so DMN is thinking a lot about what kind of condition she has to make. Whenever Azalea Festival time comes, all AGS are going to be around there, so those AGS will help to erase all those memories. If someone makes a sexual mistake, chapter 2, then in our spirit DMN can see a red color, which is not erased. Even after being forgiven, the red color remains. So, we need to totally clean this.